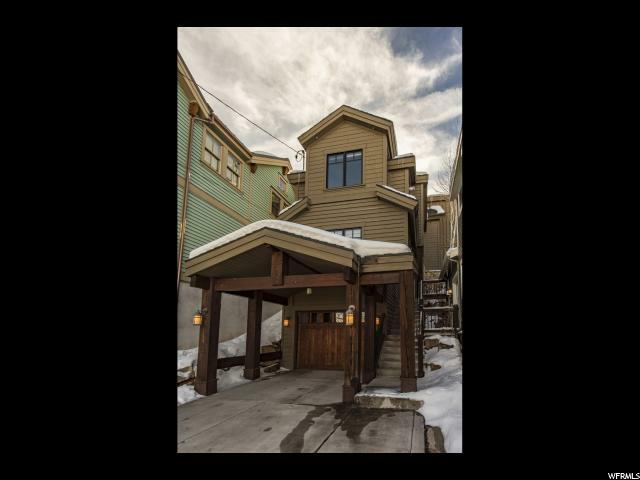 All Park City homes currently listed for sale in Park City as of 04/25/2019 are shown below. You can change the search criteria at any time by pressing the 'Change Search' button below. "Rising from the ground as a natural extension of an ultra private & gated home site, White Pine Ranches Three seamlessly floats across its natural surroundings. Meticulously designed water features with large boulders effortlessly flow throughout the property creating a zen like atmosphere. Thoughtfully conceived as a place of refuge & family gatherings, this timeless contemporary residence elevated high above natural grade, provides 360 degree unobstructed Iron Mountain, ski run & down valley views. A desired open floor plan featuring organic materials sets the tone for a peaceful & intimate living experience where the outdoor is welcomed in at every turn. Expansive floor to ceiling windows artfully disappear to celebrate the connection between interior & exterior spaces. A ski easement provides private, quick access to Tombstone lift where ski lovers can enjoy first powder runs at the Canyons. Only minutes to Park City's Historic Main Street & a short drive to Salt Lake Int'l Airport." "69 White Pine Canyon is the premiere Park City property; its location gives it the best ski access in Park City, with direct access to 4 of the resorts best lifts, 9990 & Peak 5, and with 20 lockers to hold all that winter gear. This 14 bedroom home has space for everyone, the remarkably lit great room with its 30-foot windows and the large living spaces sprawled throughout the home make it a perfect place for families to gather. This epic ski lodge has all the amenities you can think of and more, take a dip in the spa, warm up in the sauna or steam shower, grab a bottle of wine from the cellar and sit down to a movie in the theater. 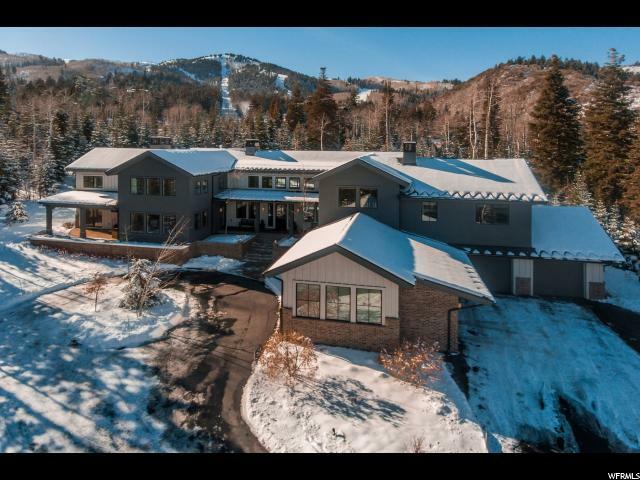 69 White Pine Canyon is one of the most sought after properties in Park City, you won't want to miss it." "Delivering an authentic western experience, polished with a modern air, the residence and grounds come together to produce a legacy property that will see no aging of style. Designed by Costantino Grandjacquet and built by Jim Clifford, the mostly single level living home frames views of all 3 ski resorts through floor-to-ceiling windows from its 7 flat acres, complete with a new pool, 3 ponds and waterfall, barn, horse arena, and guesthouse right in the heart of town. Inside the main home, 6 bedrooms and 9 bathrooms befit the 8,500 sq ft space. Finishes such as an indoor bridge over water, hand crafted ski lockers, custom stone, concrete floors and Venetian plaster complement luxuries such as a wine cellar, and theatre room." 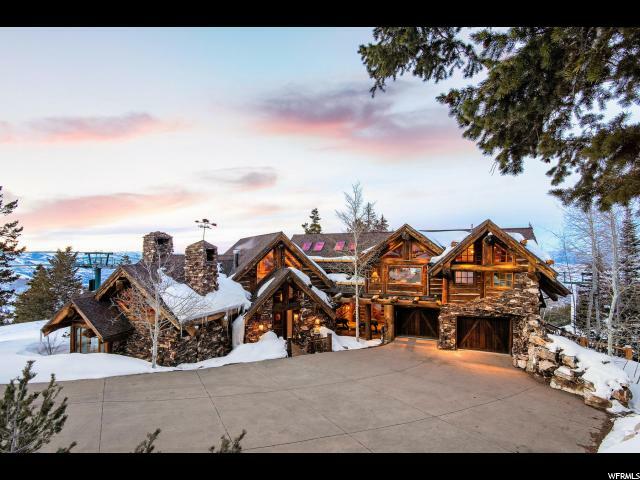 "Situated on the top of nation's largest ski resort, this home is located in the high-security ski community, The Colony at White Pine Canyon. From your home's own ski lounge, access the most desired lifts in The Canyons and take advantage of first tracks on a powder day. Situated on a 4.6-acre lot, this truly refined home with almost 19,000 square feet including a separate guest house, has 360-degree ski resort views and offers unmatched potential for great entertaining and family gatherings. In addition to the 9 bedrooms and 15 bathrooms, there are multiple offices, theater room, multiple family rooms and a gourmet kitchen. This top-quality home was designed by Jack Thomas, built by Sletta Construction and detail designs by Lisa Interior Design. A local Sheriff currently serves tenant and property manager in the guest house, possible option to continue for new owner to create a true turn key experience. 10 Minutes to Park City's historic Main Street." "Welcome to Greystone - a majestic mountain estate with unparalleled privacy, old-world influences and whimsical charm throughout. A two-story foyer welcomes you in with a spiral staircase and a great room with floor-to-ceiling windows that frame the serene golf course and ski run vistas while capturing the southern sun. Built by Midway Construction, the home provides for your every desire with well-designed living spaces. A thoughtful layout offers ease of living with precisely planned areas for effortless entertaining of family and friends both inside and out. No stone was left unturned in the meticulous planning and construction of this ultra-efficient N+1 home with high-tech home automation, multiple eco conscious features, and a pragmatic design, providing for ease of use and maintenance. Greystone is the perfect place to call home for generations to come. " "Looking for your Dream Ski Home? 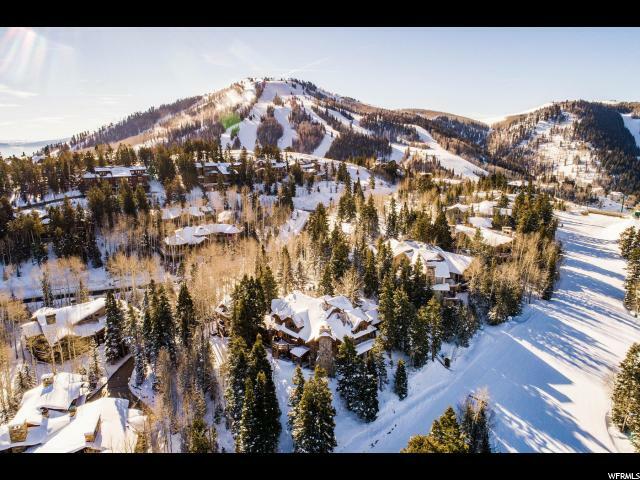 This iconic ski retreat nestled on the flagship lot in Deer Valley's prestigious Bald Eagle neighborhood is now being offered for the first time! 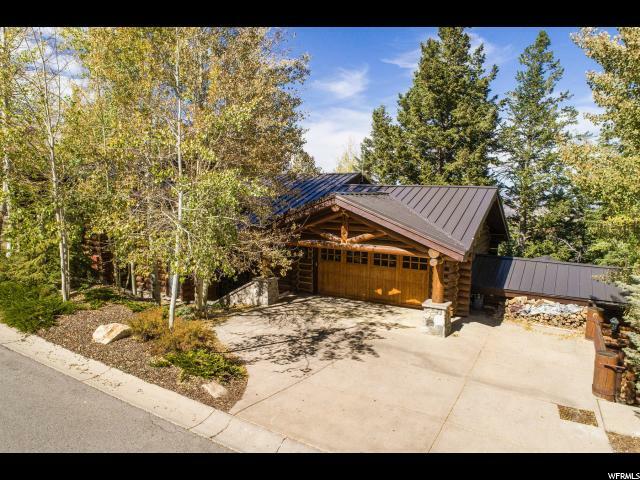 Only a couple properties in all of Deer Valley are entitled to easy ski-in and ski-out access to both Silver Lake and Snow Park base areas and this home is the best of them. This ski access offers the most enjoyable lifts and runs on the resort right outside your door and is less than 2 minutes to a variety of shops and restaurants at Silverlake's mid-mountain area. Skillful architecture has created a grand open floor plan for extended family and friends to gather and enjoy the stunning mountain and valley views while still honoring the need for intimate, warm and well defined spaces throughout the home. Discerning buyers will appreciate the timeless design, attention to detail and craftsmanship that make this extraordinary home a true work of art akin to the best of the best properties found in Jackson Hole, Sundance, and Telluride. Featuring 6 bedrooms, 9 bathrooms, a large great room, wonderful dining, eat-in chef's kitchen, lower level rumpus room that walks out to a fabulous hot tub and swimming pool, a ski prep room, multiple outdoor living spaces, a private master suite with an office, 4 astounding custom fireplaces, radiant heat and did we mention BREATH TAKING VIEWS and AMAZING SKI ACCESS! This is once in a lifetime opportunity to own a slice of ski heaven! Call for a private showing. " 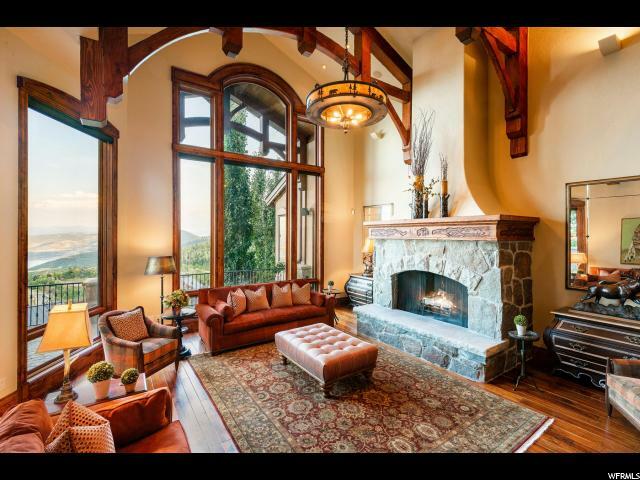 "Rare 7-acre estate located in town with ski resort views. This one of a kind property has 2 large ponds with 7 waterfalls. Beautiful landscaping surrounds the home with mature trees offering ultimate privacy. With over 11,500 square feet, this home includes a guest suite studio, 1100 bottle wine cellar, chefs gourmet kitchen, radiant heat, theatre, game room, reclaimed wood, Italian stone, expansive living room for entertaining. Large windows and French doors overlook the lush landscaping and water, outdoor living space. International flair blends seamlessly with casual mountain style, creating a unique gathering space for friends and family. Just a short drive to skiing and Historic Park City Main Street, yet 30 minutes from SLC International Airport." "Artistic iron gate welcomes family and friends into a winding drive revealing an exceptionally crafted and private residence. The gently sloping 1.26 acre site abuts Deer Valley's Big Stick and Roamer Ski Trails, and boasts views from ski slopes to the town lights of Park City. The home centers around a restaurateur-designed kitchen and huge inglenook fireplace in the great room, flanked by a dining area and family room with breakfast nook and den. Guests will love the indoor lap pool and relaxing venues from sunny decks and patios to grassy lawns and even a sports court. The master suite enjoys the privacy of the entire upper level with three fireplaces, three walk-in closets, his and hers bathrooms and a paneled study. A separate level accommodates a grand guest suite plus four additional en-suite bedrooms. There is also an au-pair bedroom, children's bunk room and guest or caretaker's apartment, bringing the bedroom count to nine. Truly a resort within a resort!" 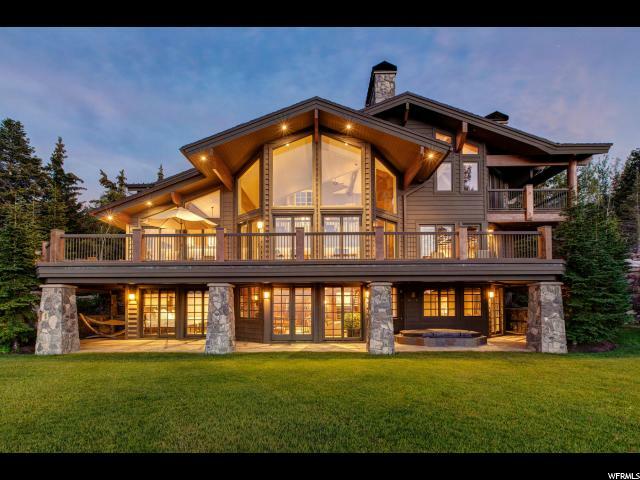 "Michael Upwall designed mountain contemporary home with great views of Park City and Deer Valley ski resorts! Designed for entertainment with indoor/outdoor living. Featuring a hillside water feature with negative edge spa/ pool. Also featuring a state of the art home theater, entire home audio and security system, heated auto courtyard, bridge to upper level meditation overlook, enclosed dog yard, temp-controlled wine cellar, EV charging, golf simulator and solar power! Dramatic floating staircase connects all 3 levels of the home. Elevator ready. Main level features a chef's kitchen, great room, dining and hearth-room that flow together seamlessly with multiple fireplaces and large balconies for flawless entertainment. Luxurious main level master suite with private study and 2 private balconies with panoramic views. Upper level sunset suite offers top-of-the-world views. Lower level has another laundry, bunk room, and 2 more guest suites for the whole family to enjoy!" 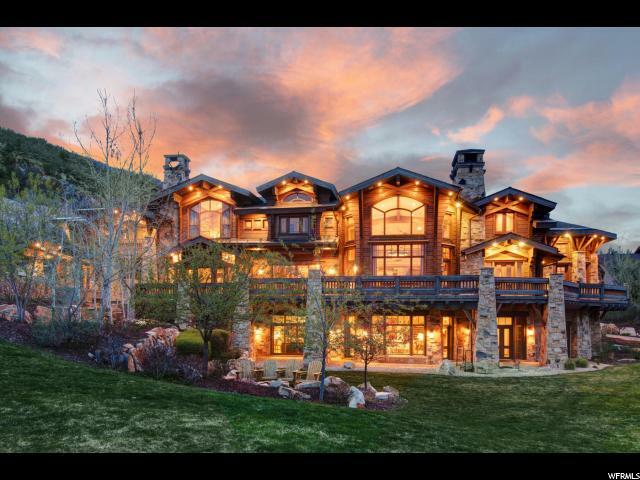 "7975 Bald Eagle Drive epitomizes the Deer Valley style of mountain architecture. This stunningly built family retreat was designed by Otto/Walker and Associate , with the original construction by Rob Sletta, and updating by Clint Magee. At approximately 12,500 square feet you will feel a part of the mountain environment due to the elegant use of timber and stone. You will not find a better ski location in all of Deer Valley. The 1.5 acre lot is situated at the intersection of Roamer and Rising Star trails, with extensive down valley views of Park City. This is the quintessential Mountain home. " "At the end of a cul-de-sac. Delve into the sophisticated and contemporary. New construction. Massive glass walls capture the unspoiled, sweeping drama of woodland, mountains, ski runs and meadow from every square foot of this opulent estate. Refined, covered, glass enclosed verandas. Astute palette of state of the art finishes. Appointments include- A must have contemporary enthusiast chef's kitchen. 2 family rooms. 5 opulent bedroom suites. 9 bathrooms. 7 fireplaces (5 indoor and 2 outdoors). Additional kitchen. And, of course, to your door, ski in- ski out. 9467 square feet. " "This home is for those seeking the finest of what the Glenwild community has to offer. This elegant home sits on a private 1.24 acre lot with ski hill and golf course views, offers walkability to the clubhouse and immediate access to the golf course at the 14th hole. Access the home via a custom designed, heated driveway lined with manicured landscaping highlighting local flora. This home will captivate you with its superior design, unmatched construction quality, clean lines and remarkable details. The home is located in the gated community of Glenwild, Utah's #1 rated golf course by Golf Digest Magazine since 2001. Life in Glenwild feels secluded and serene, but is located just 15 minutes from world class skiing at Park City and Deer Valley and 30 minutes to SLC International Airport. Located in the PC School District, Sq. Ft. source is appraiser, buyer to verify. Not all amenities available without a separate Glenwild membership." "Escape to the mountains for privacy and seclusion in this stunning home designed by Otto-Walker Architects. The open floorplan of the kitchen and great room enhance the breathtaking down valley views. Lounge on one of the two panoramic decks, or on the pristine lawn, surrounded by mature trees of this gorgeous mountain estate. No expense was spared when this home was built by Watts Construction, from the imported mahogany from Honduras, or the stone and timber from the Pacific Northwest. Ski out of the back door from this mid-mountain, Alta Vista location to the Last Chance and Success ski runs of Deer Valley Resort. Upon your return, unwind in the sauna, or retreat to one of 7 bedrooms, each with en-suite bath. The media room provides additional sleeping with four queen Murphy beds. With multiple living spaces, a separate catering kitchen in the garage, and a full mother-in-law or caretaker suite; this home was built to entertain. " "Unique vantage on a precipice adjacent to Deer Valley's Kimberly Ski Trail provides direct ski-in/ski-out access, the finest year-round enjoyment, and dramatic views stretching across Bald Mountain, the waters of the Jordanelle, and the majestic Uintas. Architectural design by Max Smith AIA blends a crisp modern aesthetic with a timeless European warmth. Local blond sandstone and limestone masonry compliment hardwood flooring creating an authentic ambiance. The home centers around a spacious kitchen, intimate living room, and dining area, each with light-filled windows. Find impeccable views on the heated stone patio with grill, hot tub and lawn, from this desirable Bald Eagle homesite. The master suite occupies the upper level featuring a fireplace, separate sitting area, and study. Five additional guest suites with attached baths offer privacy and convenience. Stylish entertainment areas include a billiards room with wet bar and fireplace opening onto an adjacent media room." "This luxurious Deer Valley Resort home boasts 7888 square feet of comfort and prestige, with jaw-dropping ski run views of Lady Morgan. The home is ideally positioned on the Cluster ski trail for easy ski-in/out to Northside ski trail. Built by local Thomas McPhee, you'll enjoy the thoughtful function and design of this Karen Shaw and Inouye Design residence. Elegant finishes such as Sierra walnut flooring, carved euclid timber trusses and trim, hand selected stone, and copper accents create a sense of warmth throughout. Your every need is met with the gourmet kitchen equipped with top-of-the-line appliances, butlers pantry, wet bar, climatized wine cellar, exercise room, and ski lounge with built-in ski lockers and boot warmers. The home offers main level living with an inspiring office for when work calls. A guest suite with private entrance, a sitting room and kitchenette is the perfect space for a nanny or family and friends that desire additional privacy." "Experience ultimate luxury and convenience of Deer Crest living in this custom designed masterpiece. This home features incredible Jordanelle Reservoir and mountain views, with master craftsmanship throughout, and an abundance of outdoor living space. This home boasts a beautiful hand carved spiral staircase that leads through 3 levels of private bedrooms and family rooms, allowing multiple families to enjoy the home while still maintaining privacy. 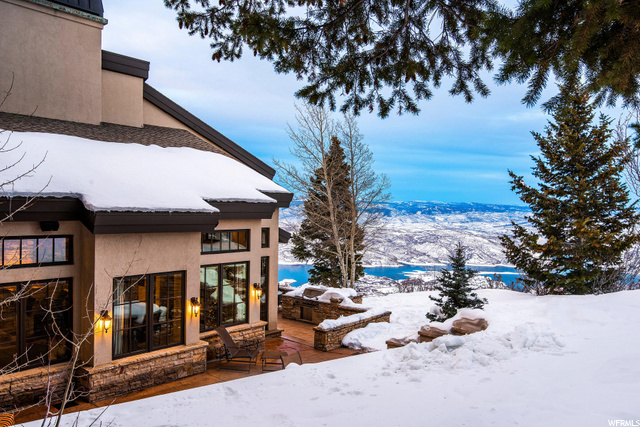 Families will create lasting memories enjoying the incredible ski access to Deer Valley Resort throughout the home, state-of-the-art theater, golf simulator room, home gym, and hot tub with dreamy views. This residence was built for entertaining with a grand kitchen, and dining room, an extra-large family room complete with pool table, pin ball machine and a beautiful wet bar. The only fully fenced yard in Deer Crest features a stone staircase & beautifully landscaped yard, making the perfect space for your pets to play and stay safe." "JUST COMPLETED - This incredible 8600 sq. ft. home is located on one of the premier lots in the The Colony, an award-winning development with the combination of beauty, size, privacy and world-class skiing and snowboarding at your doorstep. The Colony is setting the new standard for on-mountain living with 4,600 acres. Skiing begins and ends at the front door for Colony homeowners. Ten of the ski lifts are Located within The Colony including Tombstone, 9990, Peak 5, Day Break, Dreamscape, Dreamcatcher, Flat Iron, Timberline, Iron Mountain, and Quicksilver Gondola. Park City is now accessible via the 8-passenger Gondola, making Park City the largest ski resort in the United States. Incredible views and private setting makes this one of the most sought after locations in the Colony. This is one of the only 4 car garage homes currently available in the Colony. Call for a list of finishes and floor plans." "This home is the ultimate Skiers Vacation dream come true! 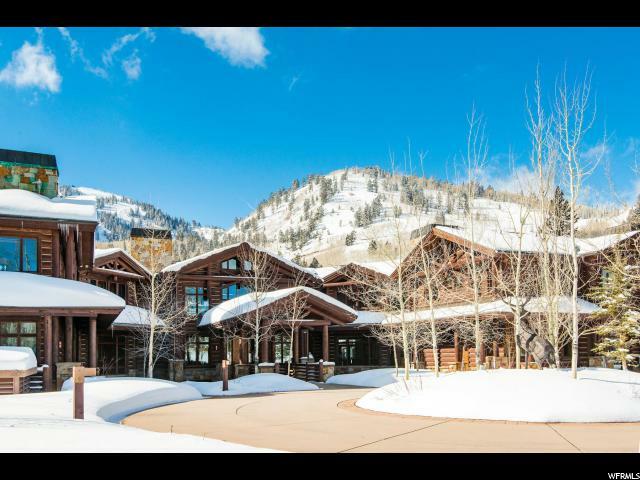 It is a gracious and warm home and is light-filled with magnificent views of Park City, the surrounding mountains and Deer Valley Resort's Last Chance ski run. Framed by mature pine and aspen trees the home is a very secluded retreat located next to the Stein Eriksen Ski Residences. Ski in ski out access does not get any better than this! There is a welcoming main floor Great Room, chef's Kitchen, Dining and Sitting Room, Family Room, Game Room, four spacious Bedroom Suites and three lovely Powder Rooms. With custom log and stone interiors, four wood burning fireplaces, generous exterior decks this home has it all. In addition, the home includes an attached private two Bedroom Guest House with a complete kitchen. Architect Rick Otto helped to extensively remodel the entire home including both kitchens. The Master Bath remodel was completed in October of 2018. 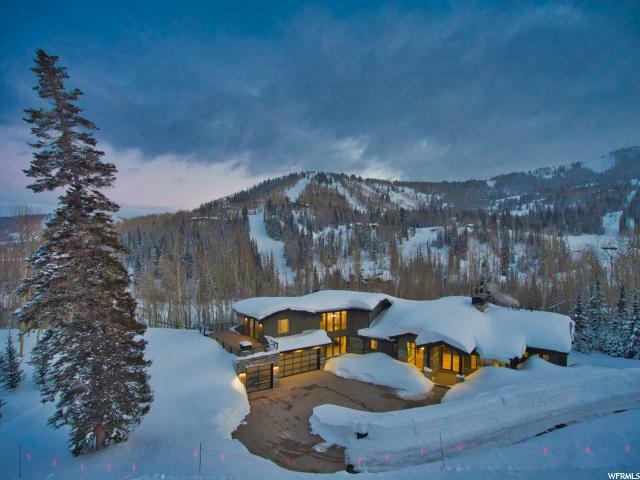 This is the picture perfect iconic Deer Valley home." 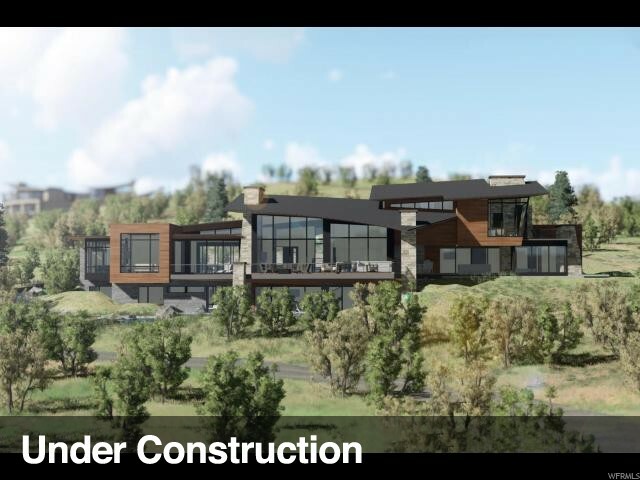 "This magnificent mountain contemporary Michael Upwall designed home is currently under construction at the Top of Promontory's Summit neighborhood. Stunning 280-degree views of all 3 ski resorts and great outdoor living from the spacious decks. 360-degree views from the private upper master suite, complete with an elevator and second master located on the main level. This generational home is a must see and true Upwall masterpiece! This home is offered with a Social Membership to Promontory's Club Amenities." "This fabulous ski home sleeps 16 making it the perfect location for family gatherings or other special events, and it has tremendous rental numbers over the past several years. 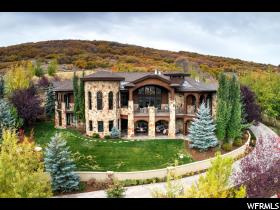 This is a spectacular 6 bedroom, 7 bath home with direct ski access to Park City Resort. Ski or board to and from the house, then walk down to Main St. for after ski food and fun. Home Theater with new updated electronics, game room, large hot tub on the back patio right next to the ski slope, elevator, and more than enough parking (ask a local how important that is in Old Town!) "
"This incredible, multi-generational, Finnish, Honka log, Michael Upwell designed home is beautifully situated on a double lot of 9.8 Acres in the Sandstone Cove subdivision. Comfort and elegance is offered in this 7-bedroom, 9-bathroom home with its massive stone fireplace, floor-to-ceiling windows and beautifully updated chef's kitchen. This home was designed for entertaining with multiple living spaces, a theater room with a 3D projector and heated outdoor patio. Equipped with Crestron programming, you can control the state-of-the-art sound system and lighting from anywhere in the house. Very recent additions include new extensive landscaping and lighting, a sound system throughout the yard, an in-ground swim spa with retractable top, and a commercial sized Mugnaini wood-burning pizza oven- just to name a few." 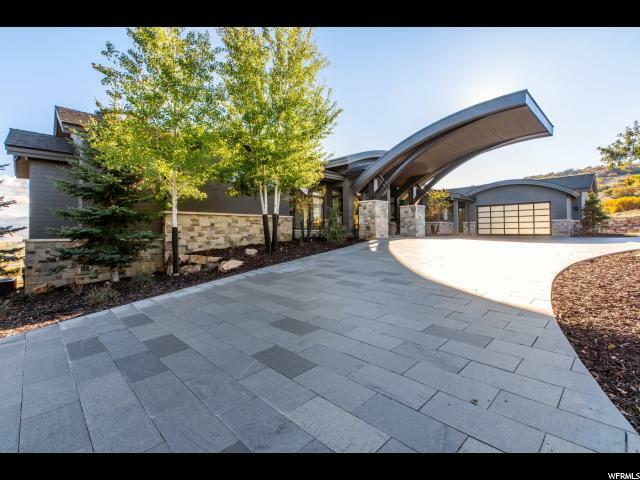 "Grand modern mountain home with 5 bedrooms, 8 baths and boasting over 11,500 square feet of beautifully designed living space and is situated in the private golf community of Glenwild, Utah's #1 rated golf course by Golf Digest. Perched on one of the largest lots in Glenwild, this home offers unparalleled views coupled with seclusion. Entertaining is made easy with a well-equipped kitchen and butler's kitchen and covered decks with outdoor fireplaces that are perfect for enjoying the stellar golf course and mountain views. Downstairs has an additional family room with a bar evoking elements of a Wild West saloon complete with a wine cellar, game room, and home theater. Generously sized bedrooms to make your company feel comfortable. Additional features include 5 car garage, craft room, two laundry rooms, steam shower, Lutron lighting and more. Located in the PC School District, just a 30-minute drive to SLC Airport. Sq. ft. source is appraiser, buyer to verify."